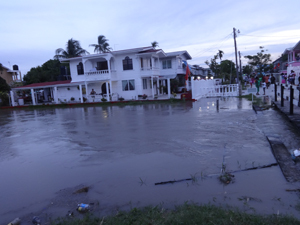 Pandemonium ensued last evening after a koker which services two neighbouring villages on the East Bank Demerara broke way, causing flooding to nearby homes in the communities. Effects of the flood caused by the damaged koker yesterday. The door of the koker which services the communities of Peter’s Hall and Providence, East Bank Demerara, (EBD) caved in under the pressure of the rising tide. But help was said to be underway. Rafael Gravesande, an engineer attached to NDIA, said that the irrigation body had notified a contractor to have the door of the koker fixed immediately. He also stated that the contractor was on his way with the necessary building materials. When Kaieteur News visited the area, residents were at the koker complaining to whomever would listen. Many of the villagers were distressed by the overflow of water that had already started coming into their homes. Some persons had already started to move household items at the upper flat of their homes. The koker attendant who identified himself as “Petam”, said that the door broke around 16:30 hours. He said that he contacted the National Drainage and Irrigation Authority (NDIA) immediately. He told Kaieteur News that it was the water pressure that broke the wood of one of the doors and removed a huge chunk of the concrete pillar attached to the koker. The attendant said that this isn’t the first time that the koker has collapsed. Petam noted that numerous complaints were made to the authorities. An overseer attached to the Neighbourhood Democratic Council, added that he had written numerous letters to the Ministry of Agriculture concerning the faulty koker but to no avail. The man said that he is only the koker attendant and he expressed concern that if the koker does not receive adequate attention and maintenance, it will fall apart completely. “People house dey nearby. The flood might ease off tonight but if it ain’t fix by tomorrow morning it gun be worse,” he added. Residents blamed the incident on the poor quality of materials, which were used to build the koker. “It’s not the right type of wood for the koker doors. The wood was not strong enough to withstand the water pressure,” said one resident. Another resident said that considerable damage was done to their homes after the koker collapsed in 2008. Many of their household articles were damaged and they never received any form of compensation. Terry Ramjohn, of Lot 64 Providence, EBD said that the last flood was widespread. He expressed hope that the koker would be fixed soon to avoid a recurrence of what the flood did a few years ago. “There are lots of young children and elderly people living in the area. Some live in flat houses and don’t have the luxury of going upstairs in the event of a flood. It is only right that the problem receives attention as soon as possible,” another person said.